(David Pike | Special to The Monitor) Pictured are former UTRGV dual enrollment students, from left: Elias Frias (Brownsville Early College High School, now a senior at UTRGV), Emma Medellin (Early College High School in Harlingen, now a UTRGV graduate), Mayra Tovar (Brownsville Early College High School, now a UTRGV graduate), Jaime Fonseca (Brownsville Early College High School, now a senior at UTRGV), Magdalena McKula (Brownsville Early College High School, now a UTRGV graduate), Enrique Granados (Trinidad Garza Early College High School in Dallas, now a senior at UTRGV) and Nallely Flores (Brownsville Early College High School, now a senior at UTRGV). The University of Texas Rio Grande Valley Dual Enrollment Program is reporting a bump in the number of students earning college credit. 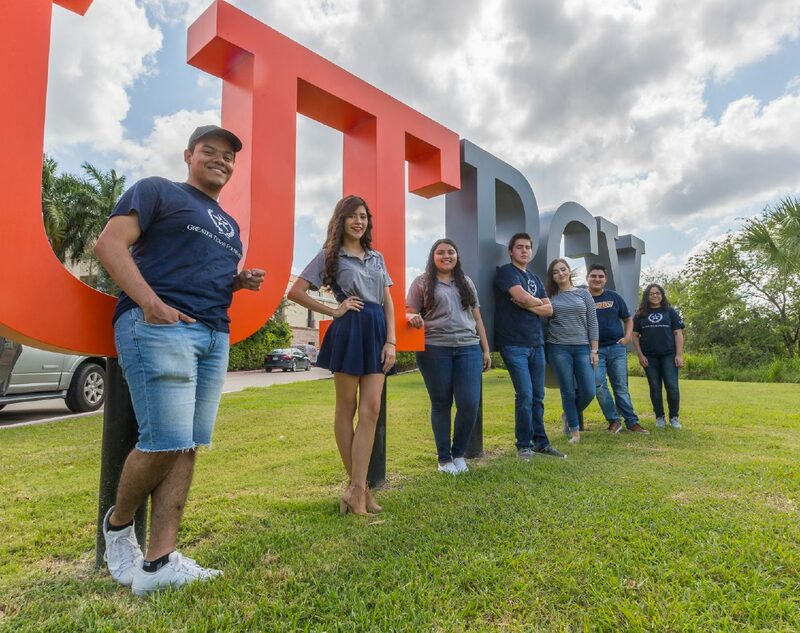 Statistics show that during UTRGV’s fall 2017 semester, 576 students were enrolled in the program. At the start of the fall 2018 semester, 722 students were enrolled, an increase of about 25 percent. In dual credit programs, high school juniors and seniors can enroll in college courses and receive both high school and college credits. UTRGV currently partners with 26 Rio Grande Valley districts to help students receive college credit. The University of Texas System recently researched the impacts of dual credit programs, such as graduation rates and student debt, and the pros and cons of dual credit from student and faculty perspectives, and found that a student’s exposure to one dual credit course can have a significant impact on academic success. Michael Aldape, UTRGV director of Special Programs overseeing the Dual Enrollment Program, said qualifying high school students are able to take courses in the UTRGV core curriculum, such as English 1301, College Algebra and Political Science 2305. UTRGV does not charge high school students to take dual enrollment courses. To get students involved with the program, UTRGV representatives consult with school counselors and district administrators about establishing a Memorandum of Understanding to review the program’s workings and assisting the students. Cindy Valdez, UTRGV associate vice president for Student Educational Outreach, said her department works to distribute vital information about the program to high schools, parents and students. They also address any misunderstandings, as the classes students can take are applicable to most degree plans but there can be some confusion, at times. Valdez and Aldape said they’re in the process of redefining how they communicate with parents and students about the program, to reassure that they are clear on how dual credit works. They’re working to revamp their website and regularly visit campuses to talk with families about the program’s benefits. One of the common associations with dual credit is that it can save students money once they get to a university. Students graduate, on average, within three years of entering the university with about 60 hours completed, Aldape said. It does depend on the degree plan and the actual student, especially if they choose to grow their college experience. “We’ve seen students themselves self-identify: ‘I don’t want to graduate now. I want to take my time. I actually want to explore. I want to be involved with extracurricular activities.’ We work with them to make those intentional choices. That way, they get the full experience they want,” he said. The Dual Enrollment Department works with students individually, helping them seek a variety of opportunities to make the most of their college career. Magdalena McKula, a recent UTRGV psychology graduate and former Greater Texas Foundation Scholar, attended Brownsville Early College High School and participated in the Dual Enrollment Program. She was able to take more than a dozen college courses — all free of charge — while she was still in high school. Taking part in the program helped her prepare for college, she said, provided opportunities for scholarships, and challenged her academically. “It was one of the best decisions I made,” McKula said. “Initially, I struggled as I transitioned from high school to college courses, as I was a student who didn’t have to study to do well in high school. But, college was a wakeup call, and I did poorly academically my first two semesters. I had to learn study strategies in order to succeed academically. After that, I was on the Dean’s List and President’s List for the rest of my college career,” she said. McKula said students interested in participating in Dual Enrollment should be prepared to work hard, ask questions, take notes and not procrastinate.